With Excel files being regularly emailed around and with the ease with which you can link excel spreadsheets (and then send only one of the linked spreadsheets), a frequent question is how to stop excel from asking to update links. 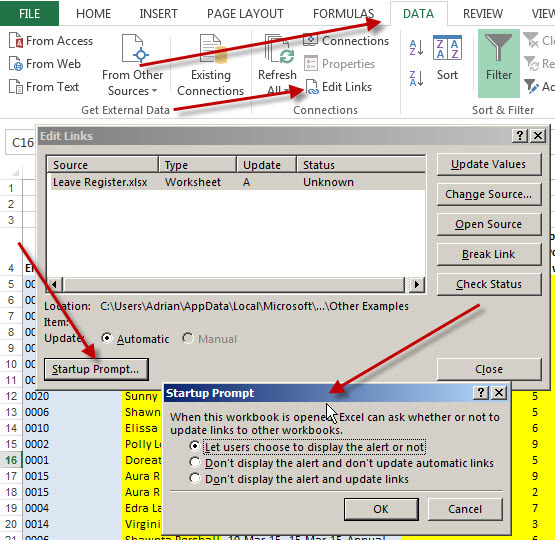 By default if Excel sees that there are links in a spreadsheet it provides a warning that there is external content and then will ask what it must do with the links. In some cases when you send a spreadsheet you don’t want the person receiving the file to accidentally choose the wrong option or not know what to do, and most times you just want them to open the file and look at it without any links being updated. ‘Don’t display the alert and don’t update automatic links’ is probably what you are looking for where the recipient will get no message and there will be no update. ‘Don’t display the alert and update links’ will still generate a warning in some cases.